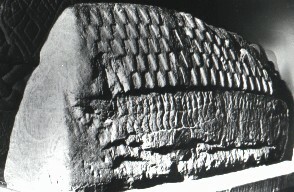 Hogback, side and end view, dated to the first half of the tenth century. This hogback is known for its depictions of warriors on the other side. It is known as the warrior's tomb. The end (west view) has the remains of a curled and contoured ribbon animal bound in thin strands of interlace. The side has lateral mouldings and unframed interlace decoration.